Western Australia’s sharks need your help! Last week, I wrote about three current shark conservation issues, including a proposed shark cull in Western Australia. Barbara Wueringer was able to deliver her letter to Western Australian government officials on Friday, and thanks to your help, it was signed by more than 100 scientists and conservationists from all over the world. Yesterday, however, another swimmer was killed by a shark in Western Australian waters. George Thomas Wainwright, 32, was a native of Texas who had been working on a boat in Australia. This attack, which is the third in the last two months, has resulted in renewed calls for a “shark cull”. The proposed plan would involve both an attempt to kill the specific shark responsible for killing Mr. Wainwright and a more general killing of all the sharks in the area. It is believed that the shark that killed Mr. Wainwright was a great white shark, also known as a “white pointer” in Australia. 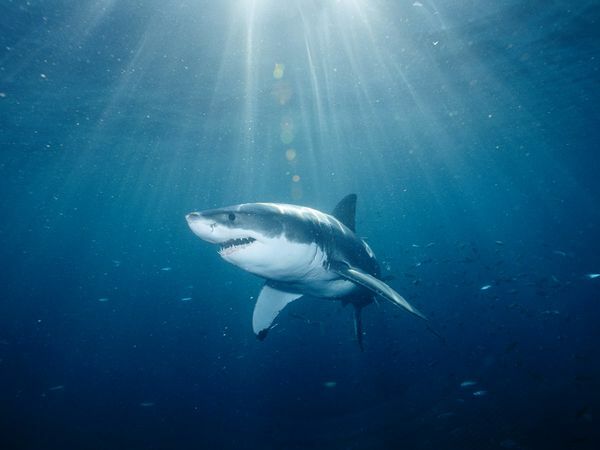 Noting that “globally, there has been a reported decline of between 60-95% in Great White Shark numbers in the last 50 years”, these animals are listed as a Threatened species under Australian law (the Environmental Protection and Biodiversity Conservation Act). One of the key components of the Australian government’s recovery plan for great white sharks (found here) is to “reduce the impact of shark control activities on white sharks”. In other words, if relevant government officials believe that they have identified the exact individual shark that killed or injured a human, then authorized government officials are allowed to kill that shark. Since these animals don’t often spend time in one area (often traveling tens of kilometers in a day) and forensic technology can only identify the offending shark by size and species, this law doesn’t make a lot of sense to me. The odds of people finding and positively identifying the exact individual shark responsible for an attack are essentially zero. A notable exception occurred last December in Egypt when the attacking shark (including a unique mark on it’s fin) was photographed clearly, but that isn’t the case here. This policy is based on the long-discredited “Rogue Shark” theory, which posits that while most sharks leave people alone, every once in a while a specific individual will develop a taste for human, and as long as we remove those individuals from the system, people will be safe. Obviously this is not supported by any kind of scientific data (again, with the notable exception of the Egyptian shark attacks last December, when the photographed attacker may have been responsible for more than one attack). This part of the plan is much more concerning. Coastal Western Australia is home to many species of sharks. Several of these species are endangered or threatened. Few of these species pose any threat whatsoever to humans. Many serve critically important roles in the marine ecosystem. Almost all would be killed under this new proposed rule (shark fishing gear is indiscriminate). Any human death or injury is a tragedy, but we must remember that the odds of being killed by a shark are still incredibly low. Killing so many sharks indiscriminately could result in an ecological catastrophe. Worst of all, it won’t result in making the beaches any safer for humans- sharks like the great white migrate across the oceans regularly, so killing the great whites that happen to be near Western Australia will harm their threatened populations without making Western Australian waters free of great whites for long. There are a variety of ways to keep swimmers safe from sharks without killing a threatened species or large numbers of animals that pose no threats to us whatsoever. These include (but are not limited to) aerial patrols and educational efforts. Ryan Kempster of Support Our Sharks has created a petition, which will be delivered to the premier of Western Australia on Tuesday morning (their time, which will be late Monday night Eastern standard time), asking the government to avoid shark culls as a solution to this problem. I encourage you to sign this petition before Monday evening, and to help spread the word about it. As of this writing, the petition has just over 2,000 signatures. I’d like to exceed 3,000, their stated goal, by Monday afternoon Eastern standard time. To sign the petition, please click here. Please note that commenting on this post about this issue is not the same thing as actually signing the petition, though you are encouraged to let me know if you signed the petition as a result of reading this blog post. The practice of hunting down sharks after an attack is not only archaic but futile. Do we hunt down snakes after someone is bitten in the bush? Not only are the odds of finding the individual animal responsible remote, but exactly what is supposed to be the purpose of the capital punishment of a wild animal? Will other animals see the “punishment” and modify their behaviour? Surely not – these are wild animals that are merely following their natural instincts. As the higher evolved species, we humans know the risks of entering the domain of wild animals, and we also know how to minimise them. And hopefully we are intelligent enough to seek to learn from deaths involving wild animals rather than simply satisfying our primitive fears and urges for mindless revenge. We must also keep in mind that although the loss of one of our fellow humans is indeed tragic and upsetting, sharks are themselves under far greater threat from humans. Sharks kill approximately 10 people per year around the world, as opposed to the 100 million sharks that humans kill each year. The effect of killing a large species of shark is extremely damaging to their population, since they are long-lived and slow reproducers: they typically take 2 – 3 decades to reach sexual maturity and only reproduce every couple of years. This is very similar to humans, except that far fewer sharks than humans survive to reach adulthood and reproduce due to fishing pressures. It’s a pity the petition has to be submitted now however. With 50+ heads of state arriving this week for CHOGM I hardly think premier Barnett will pay it much attention. Better to leave it until this time next week I would have thought. Just a thought, it seems a bit disingenuous to say that on the one hand shark attacks are rare, and on the other that there’s no evidence for the rogue shark theory. If the attacks are rare then surely that means no evidence one way or the other. With a string of attacks like this (ok 3 is stretching the definition of a string) and the general over fishing of ocean waters and disruption of their habitat, surely it has to be considered as a possibility. Not saying that culls are going to be at all effective against it, but the idea itself doesn’t seem unreasonable. Sorry, Mike, but “the idea doesn’t seem unreasonable” is not the basis for science. By “there’s no evidence for the rogue shark theory”, I mean that there is no evidence that a single shark has ever attacked a human more than once (which is basically the whole point of rogue shark theory) with the possible exception of the oceanic whitetip at Sharm El Sheikh last year. There is no way anyone can prove the three recent attacks are the same shark and highly unlikely considering the area where the individual attacks took place is more than 250km of coastline and up to 20km offshore. Mindless killing of an endangered species is a blindly emotional response. Spear fishing in a protected marine park half a km off the coast of an island where the water depth drops off dramatically,and where there are seal colonies.. it begs belief why our stupid premier would order the killings. Furthermore, setting numerous bated traps is not specifically hunting down the specific shark in question. Amen, Jo! Let’s remember that Colin Barnett is the same guy who campaigned one election on a promise to bring water from the Ord to Perth via an open canal… 3000+ km. Evidently not real bright. Unbelievable, if we heard a foreign country was to put out such a cull there would be uproar, LEAVE THE SHARKS ALONE WE ARE SWIMMING IN THERE OWN TERITORY, BUTS ITS LONG OVERDUE ON A CULL OF STUPID TAX WASTING GOVERNMENT OFFICIALS SAVE THE SHARKS. In 2007 we highlighted this video of a white shark posted online by a research team there. Whites have been known at this island going back to the late 1800’s. Why is it that dive operations in the region are oblivious to this fact? Why did a dive operation take this unfortunate American spearfishing in this region? Let’s start asking a few basic industry questions before we rage off on a wild goose chase to politically slaughter some animals that are just existing, nothing else. The death of this guy was a tragedy but if I was the family I would be asking what he was doing in “white waters” in the first place. It’s not like this was a surprise to anyone who keeps track of where the whites are and if we can do it all the way from California I am sure AU dive operations can do the same. eaten get out of water . SO SIMPLE How many sharks are killed every day by Asian for stupid soup . Milions . Leave then alone and swim in pool . Ocean belong to sharks , not to humans . How more stupid human race can be ??? To Australian Government , leave sharks alone !!!! Milions sharks are killed every second . If 100 people is killed by sharks every day , is nothing , how many people die every day in wars . Cull Obama too . Oceans are for big white , leave then alone. Human stupidity is huge . Cull sharks ??? What for ???? Because they swim and eat in ocean . How more no sense Australian Goverment can be . Someone with brains ????? Culling sharks is unnecessary & futile! Rottnest Island is a hotspot for charter fishing boats, spear-fishing & diving because of a deep ocean trench situated behind the island. As far as I am concerned, if humans decide to invade a foreign area & get harmed while doing so, then the onus is on them & not on the animal. The ocean is a sharks home & invading it makes us the wrong-doer. Saying that, with our oceans continually being over fished, we are taking too much leaving the oceans natural inhabitants less to choose from. Humans are upsetting the natural balance of the oceans food chain where sharks would have been at the top! So is culling sharks meant to even out the balance again? Western Australia has some of the most beautiful beaches in the world, but how do you protect over 5000km of coastline from a natural resident? You determine designated swimming areas, educate beach goers on the dangers, have coastguard towers & shark repellents? Hi, just wondering if another petition will be put up if the government decides to pursue their plan further?? No idea. I hope we don’t need to make one because I hope that plans for the cull are abandoned. I’m shocked and embarressed that our government is even entertaining the idea of culling sharks – as many of you have said – WHAT WILL THIS ACHIEVE?? Let alone the culling plan, what about the baited hooks they have in the waters right now?! What do they think this will do? Attract sharks. Yes. It will. Then what????!!! If they don’t wish to have more sharks in the area, then why are they using bait to attract them??!! Stupidity. Let’s hope that this is a bandaid PR reaction to the un-educated the publics’ cry for ‘safety’ in ‘our’ waters. Thank you David for your Blog it’s the first decent article I have read on the concern for the sharks and what we can do about it.